Untick this box if you do not want to crawl images. Please note, we check the link but don’t crawl the content. This prevents the spider checking images linked to using the image tag (img src=”image.jpg”). Images linked to via any other means will still be checked, for example, using an anchor tag (a href=”image.jpg”). Untick this box if you do not want to check CSS links. Untick this box if you do not want to check flash links. Untick this box if you do not want to check any external links or resources. Please note, this can include images, CSS, JS, hreflang attributes and canonicals (if they are external). Untick this box if you do not want to crawl links outside of a sub folder you start from. This option provides you the ability to crawl within a start sub folder, but still crawl links that those URLs link to which are outside of the start folder. By default the SEO Spider will not crawl internal or external links with the ‘nofollow’ attribute, or links from pages with the meta nofollow tag and nofollow in the X-Robots-Tag HTTP Header. If you would like the SEO Spider to crawl these, simply tick the relevant option. By default the SEO Spider will only crawl the subdomain you crawl from and treat all other subdomains encountered as external sites. To crawl all subdomains of a root domain, use this option. By default the SEO Spider will only crawl the subfolder (or sub directory) you crawl from forwards. However, if you wish to start a crawl from a specific sub folder, but crawl the entire website, use this option. By default the SEO Spider will crawl canonicals (canonical link elements or http header) and use the links contained within for discovery. If you do not wish to crawl canonicals, then please untick this box. Please note, that canonicals will still be reported and referenced in the SEO Spider, but they will not be crawled for discovery. By default the SEO Spider will not crawl rel=”next” and rel=”prev” elements or use the links contained within it for discovery. If you wish to crawl the pages referenced in rel=”next” and rel=”prev” elements, please tick this box. By default the SEO Spider will extract hreflang attributes and display hreflang language and region codes and the URL under the hreflang tab. However, the URLs found in the hreflang attributes will not be crawled, unless ‘Crawl hreflang’ is ticked. With this setting enabled hreflang url’s will be extracted from a sitemap uploaded in list mode. Enable this configuration for URLs discovered in the hreflang attributes to be crawled. The SEO Spider will not crawl XML Sitemaps by default (in regular ‘Spider’ mode). To crawl XML Sitmaps and populate the filters in the Sitemaps tab, this configuration should be enabled. When the ‘Crawl Linked XML Sitemaps’ configuration is enabled, you can choose to either ‘Auto Discover XML Sitemaps via robots.txt’, or supply a list of XML Sitemaps by ticking ‘Crawl These Sitemaps’, and pasting them into the field that appears. Please note – Once the crawl has finished, a ‘Crawl Analysis’ will need to be performed to populate the Sitemap filters. By default the SEO Spider will not extract details of AMP URLs contained within rel=”amphtml” link tags, that will subsequently appear under the AMP tab. Enable this configuration to extract and report on URLs contained within rel=”amphtml” link tags. By default the SEO Spider will not crawl AMP URLs linked to from rel=”amphtml” link tags, that will subsequently appear under the AMP tab. Enable this configuration to crawl and report on URLs contained within rel=”amphtml” link tags. The free version of the software has a 500 URL crawl limit. If you have a licensed version of the tool this will be replaced with 5 million URLs, but you can include any number here for greater control over the number of pages you wish to crawl. You can choose how deep the SEO Spider crawls a site (in terms of links away from your chosen start point). Control the number of folders (or sub directories) the SEO Spider will crawl. Control the number of query string parameters (?x=) the SEO Spider will crawl. Control the length of URLs that the SEO Spider will crawl. There’s a default max URL length of 2,000, due to the limits of the database storage. This option provides the ability to control the number of redirects the SEO Spider will follow. Old AJAX Crawling Scheme: Implements Google’s now deprecated AJAX Crawling Scheme. Note: If you are running a supported OS and are still unable to use rendering, it could be you are running in compatibility mode. To check this, go to your installation directory (C:\Program Files (x86)\Screaming Frog SEO Spider\) , right click on ScreamingFrogSEOSpider.exe, select Properties then the Compatibility tab and check you don’t have anything ticked under the Compatibility mode section. You can select various window sizes from Googlebot desktop, Googlebot mobile and various other devices. As default the SEO Spider does not accept cookies, like a search bot. However, you can choose to accept cookies by ticking this box. The SEO Spider will automatically pause when a crawl has reached the memory allocation and display a ‘high memory usage’ message. However, you can choose to turn this safeguard off completely. This feature allows the SEO Spider to follow redirects until the final redirect target URL in list mode, ignoring crawl depth. This is particularly useful for site migrations, where URLs may perform a number of 3XX redirects, before they reach their final destination. To view the chain of redirects, we recommend using the ‘redirect chains‘ report. This feature allows the SEO Spider to follow canonicals until the final redirect target URL in list mode, ignoring crawl depth. This is particularly useful for site migrations, where canonicals might be canonicalised multiple times, before they reach their final destination. To view the chain of canonicals, we recommend enabling this configuration and using the ‘redirect chains‘ report. This option means URLs with ‘noindex’ will not be reported in the SEO Spider. This option means URLs which have been canonicalised to another URL, will not be reported in the SEO Spider. This option means URLs with a rel=”prev” in the sequence, will not be reported in the SEO Spider. Only the first URL in the paginated sequence with a rel=”next” attribute will be reported. If enabled will extract images from the srcset attribute of the <img> tag. In the example below this would be image-1x.png and image-2x.png as well as image-src.png. The client (in this case, the SEO Spider) will then make all future requests over HTTPS, even if following a link to an HTTP URL. When this happens the SEO Spider will show a Status Code of 307, a Status of “HSTS Policy” and Redirect Type of “HSTS Policy”. You can disable this feature and see the ‘true’ status code behind a redirect (such as a 301 permanent redirect for example). Please see more details in our ‘An SEOs guide to Crawling HSTS & 307 Redirects‘ article. You can disable the ‘Respect Self Referencing Meta Refresh’ configuration to stop self referencing meta refresh URLs being considered as ‘non-indexable’. It’s fairly common for sites to have a self referencing meta refresh for various reasons, and generally this doesn’t impact indexing of the page. However, it should be investigated further, as it’s redirecting to itself, and this is why it’s flagged as ‘non-indexable’. As default the SEO Spider will wait 20 seconds to get any kind of http response from a URL. You can increase the length of waiting time, which is useful for very slow websites. This option provides the ability to automatically re-try 5XX responses. Often these responses can be temporary, so re-trying a URL may provide a 2XX response. By default the SEO Spider will not extract structured data. This configuration option enables the SEO Spider to extract JSON-LD structured data, and for it to appear under the ‘Structured Data’ tab. By default the SEO Spider will not extract any structured data. This configuration option enables the SEO Spider to extract Microdata structured data, and for it to appear under the ‘Structured Data’ tab. By default the SEO Spider will not extract any structured data. This configuration option enables the SEO Spider to extract RDFa structured data, and for it to appear under the ‘Structured Data’ tab. This configuration option is only available, if one or more of the structured data formats are enabled for extraction. If enabled, then the SEO Spider will validate structured data against Schema.org specifications. It checks whether the types and properties exist and will show ‘errors’ for any issues encountered. For example, it checks to see whether http://schema.org/author exists for a property, or http://schema.org/Book exist as a type. It validates against main and pending Schema vocabulary from Schema version 3.4. The Structured Data tab and filter will show details of validation errors. Additionally, this validation checks for out of date schema use of Data-Vocabulary.org. If enabled, then the SEO Spider will validate structured data against Google search features according to their own documentation. Validation issues for required properties will be classed as errors, while issues around recommended properties will be classed as warnings, in the same way as Google’s own Structured Data Testing Tool. The Structured Data tab and filter will show details of Google feature validation errors and warnings. This option provides the ability to control the character and pixel width limits in the SEO Spider filters in the page title and meta description tabs. For example, changing the minimum pixel width default number of ‘200’, would change the ‘Below 200 Pixels’ filter in the ‘Page Titles’ tab. This allows you to set your own character and pixel width based upon your own preferences. Please note – This does not update the SERP Snippet preview at this time, only the filters within the tabs. These options provide the ability to control the character length of URLs, h1, h2 and image alt text filters in their respective tabs. You can also control the max image size. By default the SEO Spider will obey robots.txt protocol. The SEO Spider will not be able to crawl a site if its disallowed via robots.txt. However, this option allows you to ignore this protocol which is down to the responsibility of the user. This option actually means the SEO Spider will not even download the robots.txt file. So it also means ALL robots directives will be completely ignored. By default internal URLs blocked by robots.txt will be shown in the ‘Internal’ tab with Status Code of ‘0’ and Status ‘Blocked by Robots.txt’. To hide these URLs in the interface unselect this option. This option is not available if ‘Ignore robots.txt’ is checked. You can also view internal URLs blocked by robots.txt under the ‘Response Codes’ tab and ‘Blocked by Robots.txt’ filter. This will also show the robots.txt directive (‘matched robots.txt line’ column) of the disallow against each URL that is blocked. By default external URLs blocked by robots.txt are hidden. To display these in the External tab with Status Code ‘0’ and Status ‘Blocked by Robots.txt’ check this option. This option is not available if ‘Ignore robots.txt’ is checked. You can also view external URLs blocked by robots.txt under the ‘Response Codes’ tab and ‘Blocked by Robots.txt’ filter. This will also show robots.txt directive (‘matched robots.txt line column’) of the disallow against each URL that is blocked. You can download, edit and test a site’s robots.txt using the custom robots.txt feature under ‘Configuration > robots.txt > Custom’ which will override the live version on the site for the crawl. It will not update the live robots.txt on the site. This feature allows you to add multiple robots.txt at subdomain level, test directives in the SEO Spider and view URLs which are blocked or allowed. The custom robots.txt uses the selected user-agent in the configuration. During a crawl you can filter blocked URLs based upon the custom robots.txt (‘Response Codes > Blocked by robots.txt’) and see the matches robots.txt directive line. 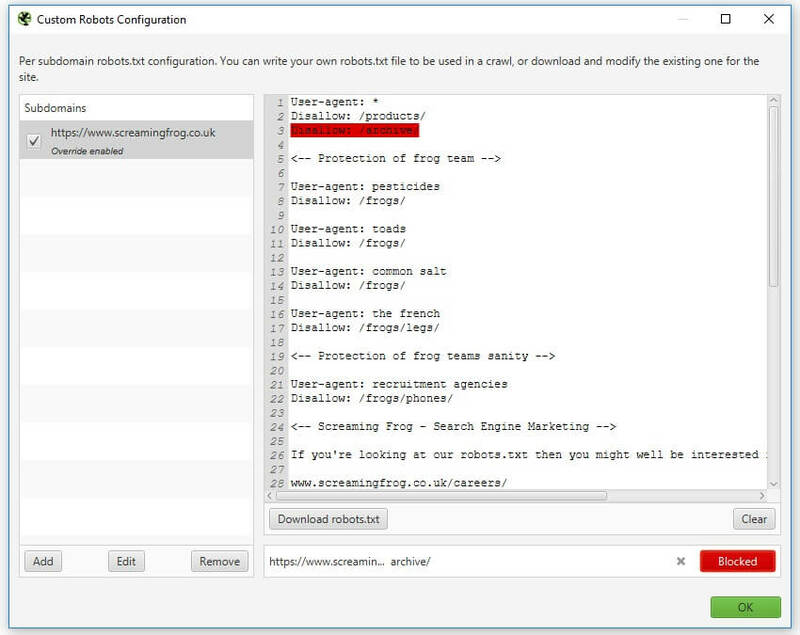 Please read our featured user guide using the SEO Spider as a robots.txt tester. Please note – As mentioned above, the changes you make to the robots.txt within the SEO Spider, do not impact your live robots.txt uploaded to your server. You can however copy and paste these into the live version manually to update your live directives. The URL rewriting feature allows you to rewrite URLs on the fly. For the majority of cases, the ‘remove parameters’ and common options (under ‘options’) will suffice. However, we do also offer an advanced regex replace feature which provides further control. URL rewriting is only applied to URLs discovered in the course of crawling a website, not URLs that are entered as the start of a crawl in ‘Spider’ mode, or as part of a set of URLs in ‘List’ mode. If the website has session IDs which make the URLs appear something like this ‘example.com/?sid=random-string-of-characters’. To remove the session ID, you just need to add ‘sid’ (without the apostrophes) within the ‘parameters’ field in the ‘remove parameters’ tab. 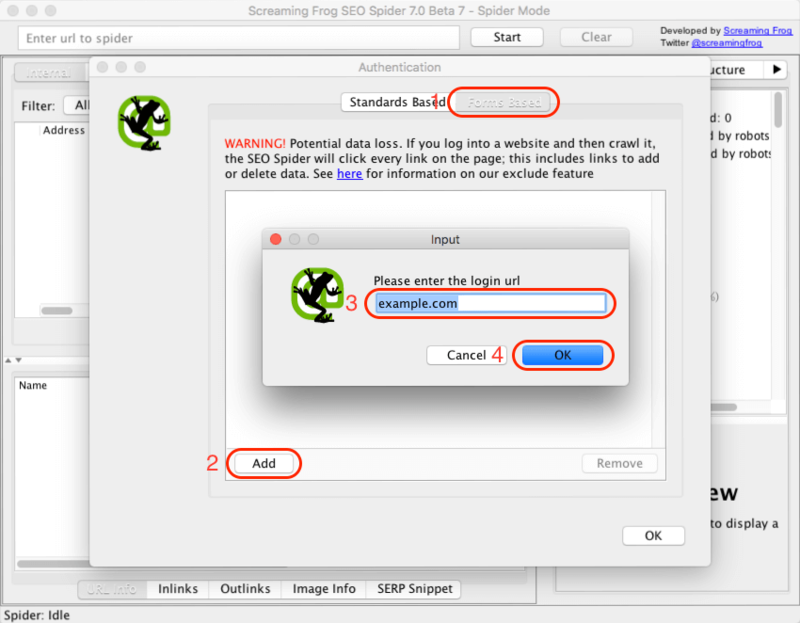 The SEO Spider will then automatically strip the session ID from the URL. You can test to see how a URL will be rewritten by our SEO Spider under the ‘test’ tab. This will strip the standard tracking parameters from URLs. We will include common options under this section. The ‘lowercase discovered URLs’ option does exactly that, it converts all URLs crawled into lowercase which can be useful for websites with case sensitivity issues in URLs. This advanced feature runs against each URL found during a crawl or in list mode. It replaces each substring of a URL that matches the regex with the given replace string. 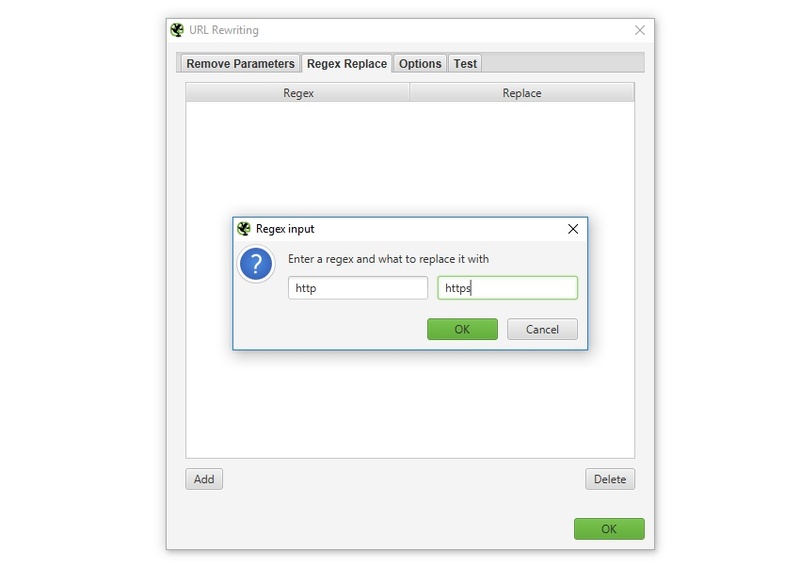 The “Regex Replace” feature can be tested in the “Test” tab of the “URL Rewriting” configuration window. 4) Removing the www. domain from any url by using an empty Replace. If you want to remove a query string parameter, please use the “Remove Parameters” feature – Regex is not the correct tool for this job! These must be entered in the order above or this will not work when adding the new parameter to existing query strings. The CDNs feature allows you to enter a list of CDNs to be treated as ‘Internal’ during the crawl. You’re able to supply a list of domains to be treated as internal. You can also supply a subfolder with the domain, for the subfolder (and contents within) to be treated as internal. ‘Internal’ links are then included in the ‘Internal’ tab, rather than ‘external’ and more details are extracted from them. This feature allows you to control which URL path the SEO Spider will crawl via regex. It narrows the default search by only crawling the URLs that match the regex which is particularly useful for larger sites, or sites with less intuitive URL structures. Matching is performed on the url encoded version of the URL. The page that you start the crawl from must have an outbound link which matches the regex for this feature to work. (Obviously if there is not a URL which matches the regex from the start page, the SEO Spider will not crawl anything!). in the ‘include’ feature. This would find the /search-engine-marketing/ and /search-engine-optimisation/ pages as they both have ‘search’ in them. Matching is done on then URL Encoded Address, you can see what this is in the URL Info tab in the lower window pane. The regular expression must match the whole URL, not just part of it. The exclude configuration allows you to exclude URLs from a crawl by supplying a list of regular expressions (regex). A URL that matches an exclude is not crawled at all (it’s not just ‘hidden’ in the interface). Hence, this will mean other URLs that do not match the exclude, but can only be reached from an excluded page will also not be found in the crawl. The exclude list is applied to new URLs that are discovered during the crawl. This exclude list does not get applied to the initial URL(s) supplied in crawl or list mode. Changing the exclude list during a crawl will affect newly discovered URLs and now be applied retrospectively to the list of pending URLs. Matching is performed on the URL encoded version of the URL. You can see the encoded version of a URL by selecting it in the main window then in the lower window pane in the details tab looking at the URL Info tab, and the value second row labelled “URL Encoded Address”. The speed configuration allows you to control the speed of the SEO Spider, either by number of concurrent threads, or by URLs requested per second. The ‘Max Threads’ option can simply be left alone when you throttle speed via URLs per second. Increasing the number of threads allows you to significantly increase the speed of the SEO Spider. By default the SEO Spider crawls at 5 threads, to not overload servers. Please use the threads configuration responsibly, as setting the number of threads high to increase the speed of the crawl will increase the number of HTTP requests made to the server and can impact a site’s response times. In very extreme cases, you could overload a server and crash it. We recommend approving a crawl rate with the webmaster first, monitoring response times and adjusting speed if there are any issues. You can find the ‘User-Agent’ configuration under ‘Configuration > HTTP Header > User-Agent’. The user-agent switcher has inbuilt preset user agents for Googlebot, Bingbot, Yahoo! Slurp, various browsers and more. This feature also has a custom user-agent setting which allows you to specify your own user agent. Details on how the SEO Spider handles robots.txt can be found here. The HTTP Header configuration allows you to supply completely custom header requests during a crawl. This means you’re able to set anything from accept-language, cookie, referer, or just supplying any unique header name. For example, there are scenarios where you may wish to supply an Accept-Language HTTP header in the SEO Spider’s request to crawl locale-adaptive content. You can choose to supply any language and region pair that you require within the header value field. The SEO Spider allows you to find anything you want in the source code of a website. The custom regex search feature will check the source code of every page you decide to crawl for what it is you wish to find. There are ten filters in total under the ‘custom’ configuration menu which allow you to input your regex and find pages that either ‘contain’ or ‘does not contain’ your chosen input. The SEO Spider uses the Java regex library, as described here. To ‘scrape’ or extract data, please use the custom extraction feature. 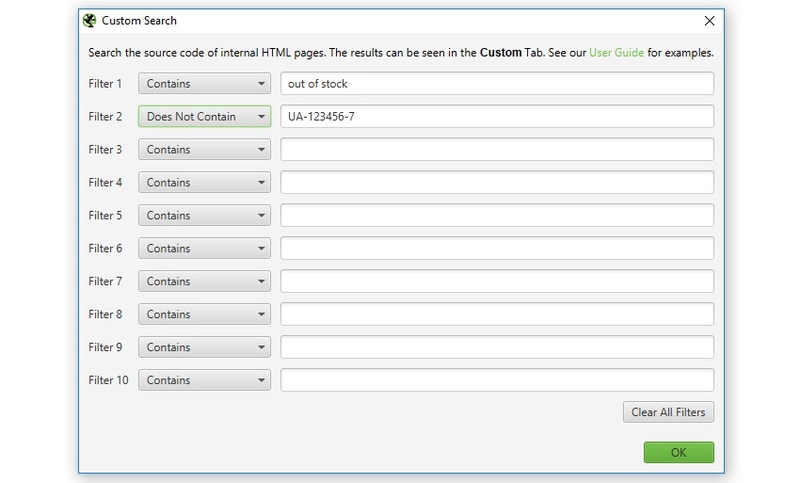 In this example above, any pages with ‘out of stock’ on them would appear in the custom tab under filter 1. Any pages which the spider could not find the Analytics UA number on would be listed under filter 2. Would match a particular word (‘example’ in this case), as \b matches word boundaries. XPath: XPath selectors, including attributes. CSS Path: CSS Path and optional attribute. Extract Text: The text content of the selected element and the text content of any sub elements. You’ll receive a tick next to your regex, Xpath or CSS Path if the syntax is valid. If you’ve made a mistake, a red cross will remain in place! The results of the data extraction appear under the ‘custom’ tab in the ‘extraction’ filter. They are also included as columns within the ‘Internal’ tab as well. For more details on custom extraction please see our Web Scraping Guide. For examples of custom extraction expressions, please see our XPath Examples and Regex Examples. More details on the regex engine used by the SEO Spider can be found here. The regex engine is configured such that the dot character matches newlines. You can connect to the Google Analytics API and pull in data directly during a crawl. The SEO Spider can fetch user and session metrics, as well as goal conversions and ecommerce (transactions and revenue) data for landing pages, so you can view your top performing pages when performing a technical or content audit. If you’re running an Adwords campaign, you can also pull in impressions, clicks, cost and conversion data and the SEO Spider will match your destination URLs against the site crawl, too. You can also collect other metrics of interest, such as Adsense data (Ad impressions, clicks revenue etc), site speed or social activity and interactions. To set this up, start the SEO Spider and go to ‘Configuration > API Access > Google Analytics’. 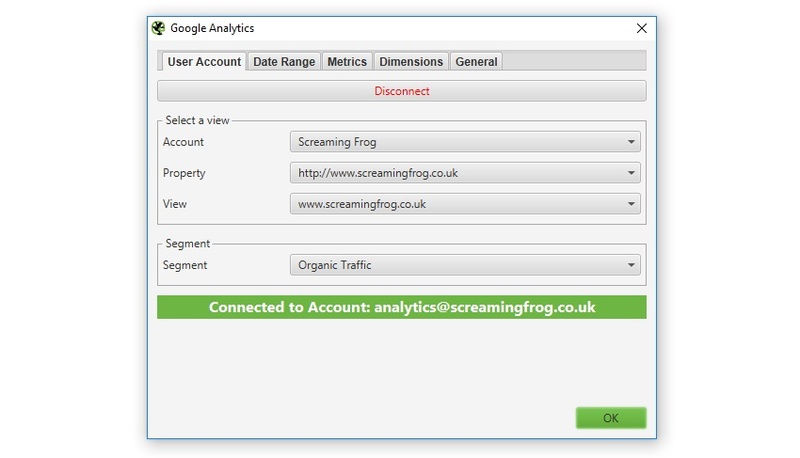 Then you just need to connect to a Google account (which has access to the Analytics account you wish to query) by granting the ‘Screaming Frog SEO Spider’ app permission to access your account to retrieve the data. Google APIs use the OAuth 2.0 protocol for authentication and authorisation. The SEO Spider will remember any Google accounts you authorise within the list, so you can ‘connect’ quickly upon starting the application each time. 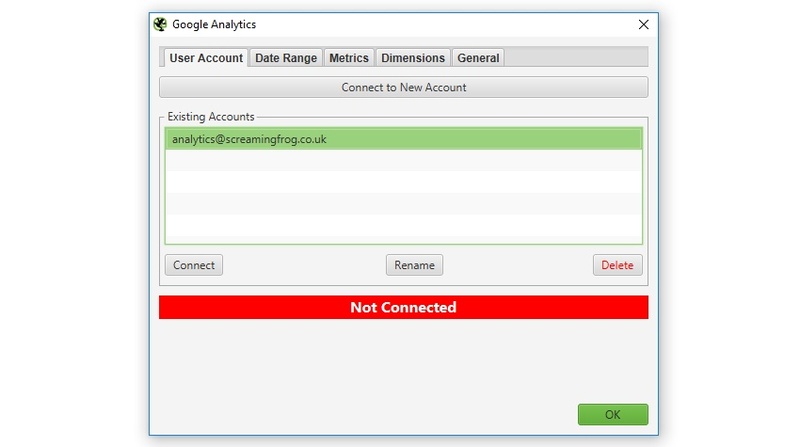 Once you have connected, you can choose the relevant Google Analytics account, property, view, segment and date range! You can also set the dimension of each individual metric against either page path and, or landing page which are quite different (and both useful depending on your scenario & objectives). 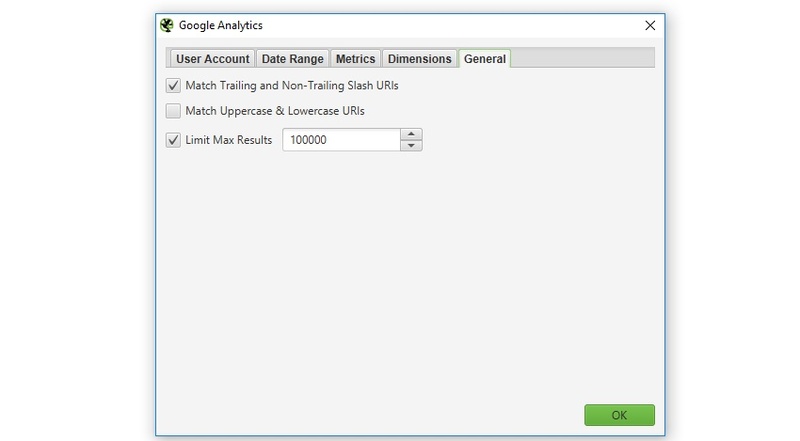 There are scenarios where URLs in Google Analytics might not match URLs in a crawl, so we cover these by matching trailing and non-trailing slash URLs and case sensitivity (upper and lowercase characters in URLs). Google doesn’t pass the protocol (HTTP or HTTPS) via their API, so we also match this data automatically. 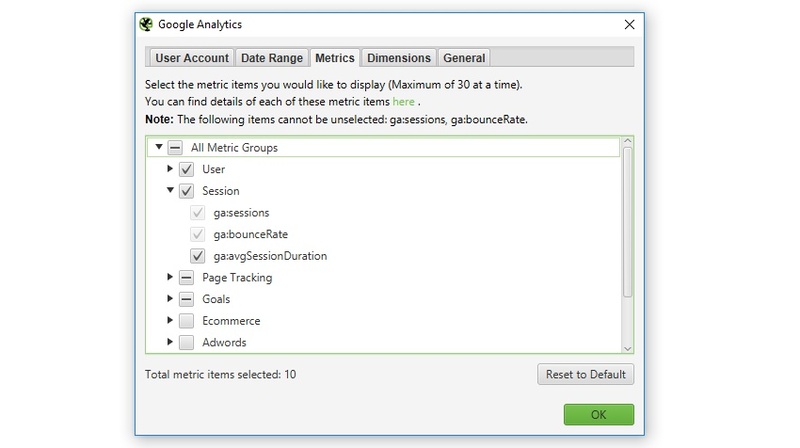 When selecting either of the above options, please note that data from Google Analytics is sorted by sessions, so matching is performed against the URL with the highest number of sessions. Data is not aggregated for those URLs. 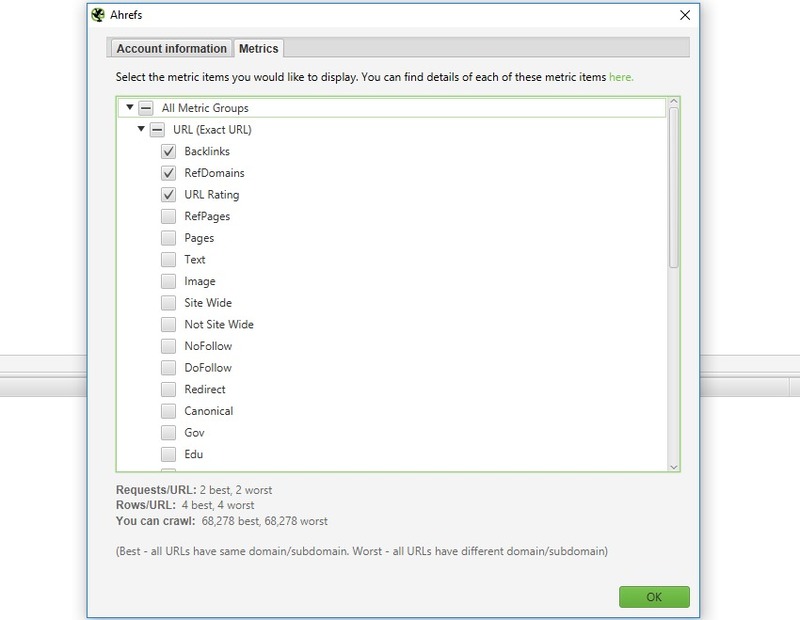 Match Trailing and Non-Trailing Slash URLs – Allows both http://example.com/contact and http://example.com/contact/ to match either http://example.com/contact or http://example.com/contact/ from GA, whichever has the highest number of sessions. Match Uppercase & Lowercase URLs – Allows http://example.com/contact.html, http://example.com/Contact.html and http://example.com/CONTACT.html to match the version of this URL from GA with the highest number of sessions. 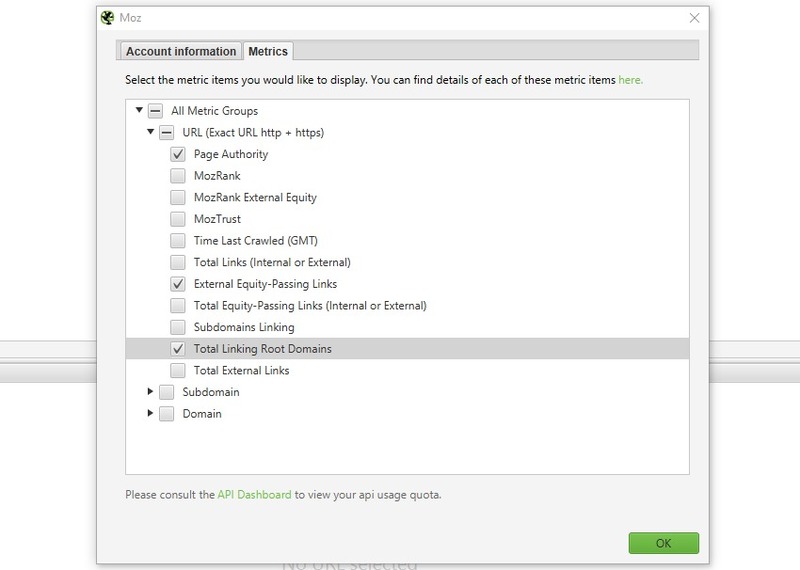 If you have hundreds of thousands of URLs in GA, you can choose to limit the number of URLs to query, which is by default ordered by sessions to return the top performing page data. When you hit ‘start’ to crawl, the Google Analytics data will then be fetched and display in respective columns within the ‘Internal’ and ‘Analytics’ tabs. There’s a separate ‘Analytics’ progress bar in the top right and when this has reached 100%, crawl data will start appearing against URLs. The more URLs you query, the longer this process can take, but generally it’s extremely quick. Non-Indexable with GA Data – This means the URL is non-indexable, but still has data from GA.
Orphan URLs – This means the URL was only discovered via GA, and was not found via an internal link during the crawl. As an example for our own website, we can see there is ‘no GA data’ for blog category pages and a few old blog posts, as you might expect (the query was landing page, rather than page). Remember, you may see pages appear here which are ‘noindex’ or ‘canonicalised’, unless you have ‘respect noindex‘ and ‘respect canonicals‘ ticked in the advanced configuration tab. 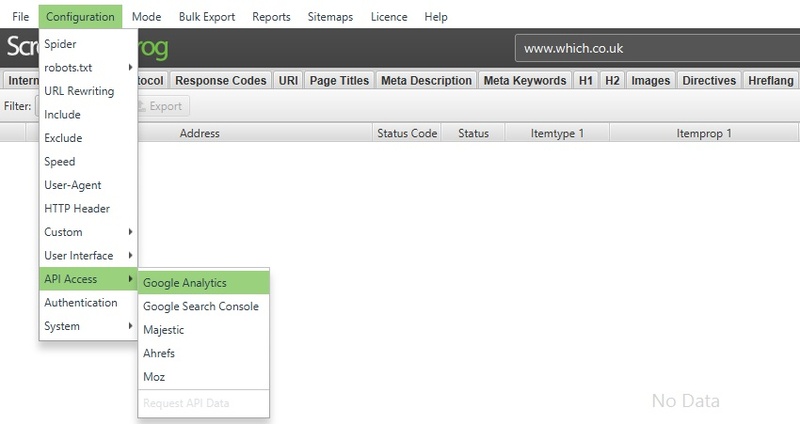 If GA data does not get pulled into the SEO Spider as you expected, then analyse the URLs in GA under ‘Behaviour > Site Content > All Pages’ and ‘Behaviour > Site Content > Landing Pages’ depending on which dimension you choose in your query. The URLs here need to match those in the crawl, for the data to be matched accurately. If they don’t match, then the SEO Spider won’t be able to match up the data accurately. We recommend checking your default Google Analytics view settings (such as ‘default page’) and filters which all impact how URLs are displayed and hence matched against a crawl. If you want URLs to match up, you can often make the required amends within Google Analytics. You can connect to the Google Search Analytics API and pull in data directly during a crawl. The SEO Spider can fetch impressions, clicks, CTR and position metrics from Google Search Analytics, so you can view your top performing pages when performing a technical or content audit. To set this up, start the SEO Spider and go to ‘Configuration > API Access > Google Search Console’. 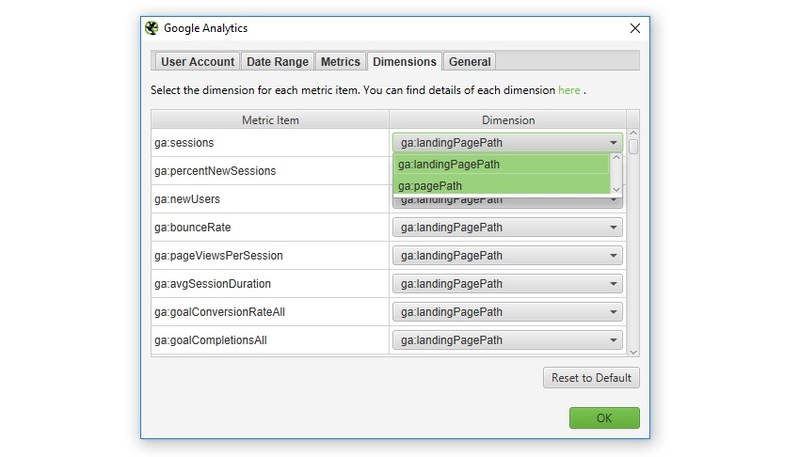 Connecting to Google Search Console works in the same way as already detailed in our step by step Google Analytics integration guide. 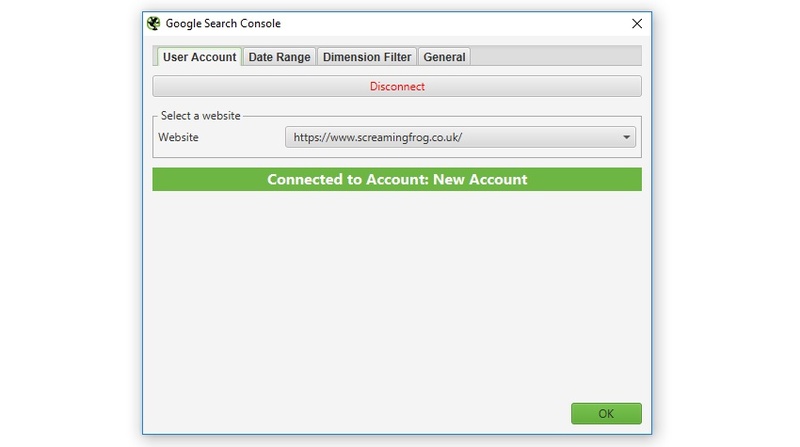 You just need to connect to a Google account (which has access to the Search Console account you wish to query) by granting the ‘Screaming Frog SEO Spider’ app permission to access your account to retrieve the data. Google APIs use the OAuth 2.0 protocol for authentication and authorisation. The SEO Spider will remember any Google accounts you authorise within the list, so you can ‘connect’ quickly upon starting the application each time. Once you have connected, you can choose the relevant website property, date range and dimensions! 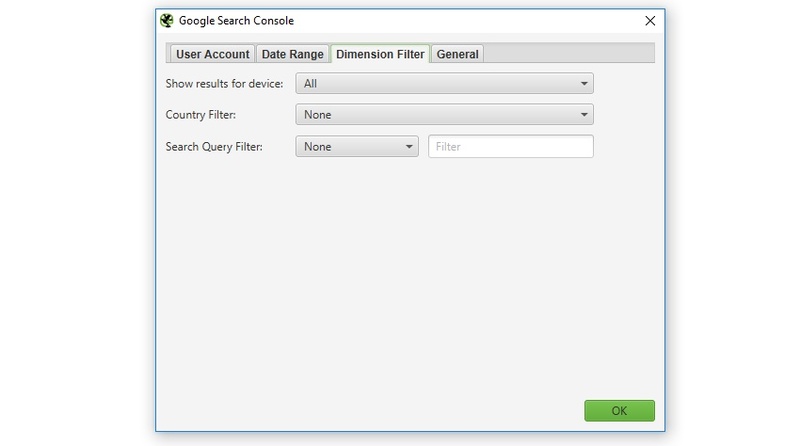 There are three dimension filters, device type (desktop, tablet and mobile), a country filter and a search query filter for ‘contain’ or ‘doesn’t contain’ words, to exclude brand queries as an example. No GSC Data – This means that the API didn’t return any data for the URLs in the crawl. So the URLs either didn’t receive any impressions, or perhaps the URLs in the crawl are just different to those in GSC for some reason. Non-Indexable with GSC Data – This means the URL is non-indexable, but still has data from GSC. Orphan URLs – This means the URL was only discovered via GSC, and was not found via an internal link during the crawl. In order to use Majestic, you will need a subscription which allows you to pull data from their API. You then just need to navigate to ‘Configuration > API Access > Majestic’ and then click on the ‘generate an Open Apps access token’ link. You will then be taken to Majestic, where you need to ‘grant’ access to the Screaming Frog SEO Spider. You will then be given a unique access token from Majestic. You can then select the data source (fresh or historic) and metrics, at either URL, subdomain or domain level. Then simply click ‘start’ to perform your crawl, and the data will be automatically pulled via their API, and can be viewed under the ‘link metrics’ and ‘internal’ tabs. In order to use Ahrefs, you will need a subscription which allows you to pull data from their API. You then just need to navigate to ‘Configuration > API Access > Ahrefs’ and then click on the ‘generate an API access token’ link. You will then be taken to Ahrefs, where you need to ‘allow’ access to the Screaming Frog SEO Spider. 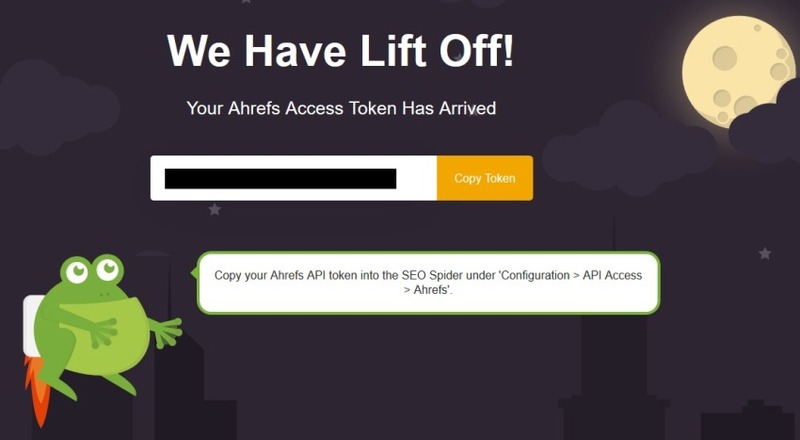 You will then be given a unique access token from Ahrefs (but hosted on the Screaming Frog domain). 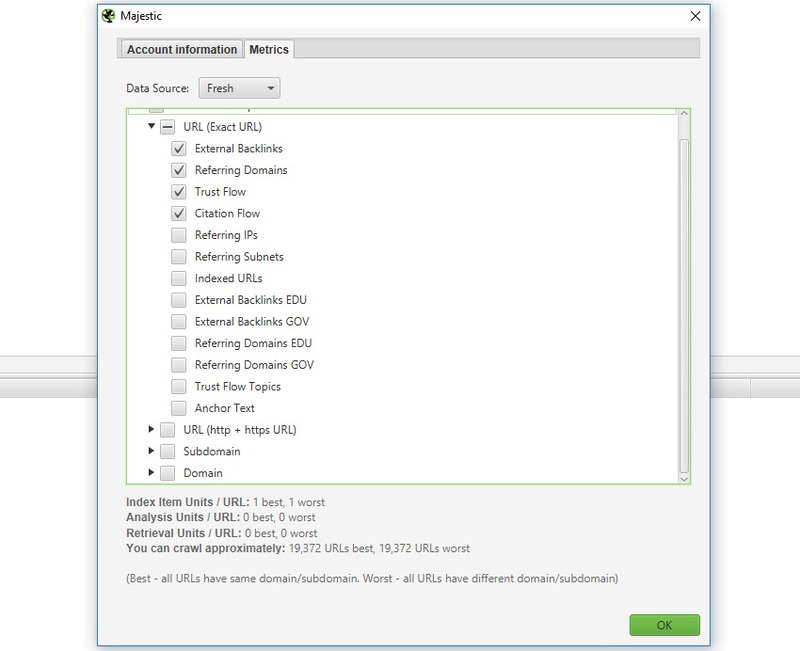 You can then select the metrics you wish to pull at either URL, subdomain or domain level. You will require a Moz account to pull data from the Mozscape API. Moz offer a free limited API and a separate paid API, which allows users to pull more metrics, at a faster rate. Please note, this is a seperate subscription to a standard Moz PRO account. You can read about free vs paid access over at Moz. To access the API, with either a free account, or paid subscription, you just need to login to your Moz account and view your API ID and secret key. You can then select the metrics available to you, based upon your free or paid plan. Simply choose the metrics you wish to pull at either URL, subdomain or domain level. The SEO Spider supports two forms of authentication, standards based which includes basic and digest authentication, and web forms based authentication. There is no set-up required for basic and digest authentication, it is detected automatically during a crawl of a page which requires a login. If you visit the website and your browser gives you a pop-up requesting a username and password, that will be basic or digest authentication. If the login screen is contained in the page itself, this will be a web form authentication, which is discussed in the next section. Often sites in development will also be blocked via robots.txt as well, so make sure this is not the case or use the ‘ignore robot.txt configuration‘. Then simply insert the staging site URL, crawl and a pop-up box will appear, just like it does in a web browser, asking for a username and password. Enter your credentials and the crawl will continue as normal. You cannot pre-enter login credentials – they are entered when URLs that require authentication are crawled. This feature does not require a licence key. Try to following pages to see how authentication works in your browser, or in the SEO Spider. There are other web forms and areas which require you to login with cookies for authentication to be able to view or crawl it. The SEO Spider allows users to log in to these web forms within the SEO Spider’s built in Chromium browser, and then crawl it. This feature requires a licence to use it. To log in, simply navigate to ‘Configuration -> Authentication’ then switch to the ‘Forms Based’ tab, click the ‘Add’ button, enter the URL for the site you want to crawl, and a browser will pop up allowing you to log in. Please note – This is a very powerful feature, and should therefore be used responsibly. The SEO Spider clicks every link on a page; when you’re logged in that may include links to log you out, create posts, install plugins, or even delete data. Forms based authentication uses the configured User Agent. If you are unable to login, perhaps try this as Chrome or another browser. The SEO Spider uses Java which requires memory to be allocated at start-up. By default the SEO Spider will allow 1gb for 32-bit, and 2gb for 64-bit machines. Increasing memory allocation will enable the SEO Spider to crawl more URLs, particularly when in RAM storage mode, but also when storing to database. We recommend setting the memory allocation to 2gb below you’re total physcial machine memory. If you’d like to find out more about crawling large websites, memory allocation and the storage options available, please see our guide on crawling large websites. 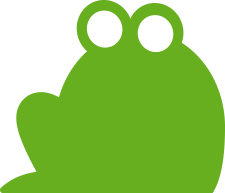 The Screaming Frog SEO Spider uses a configurable hybrid engine, allowing users to choose to store crawl data in RAM, or in a database. By default the SEO Spider uses RAM, rather than your hard disk to store and process data. This provides amazing benefits such as speed and flexibility, but it does also have disadvantages, most notably, crawling at scale. 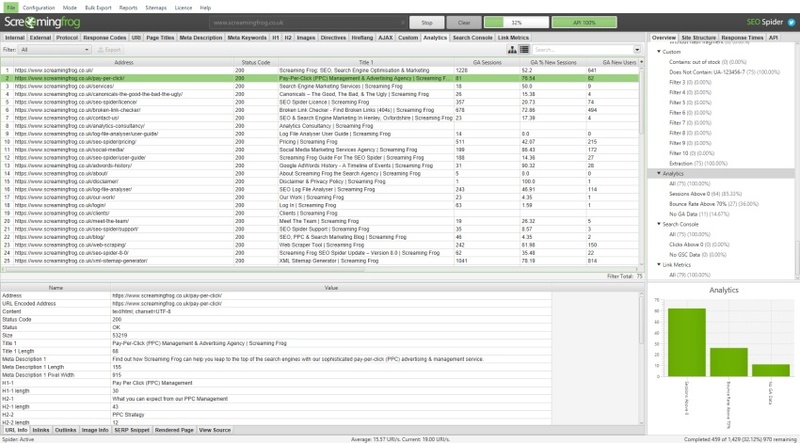 However, if you have an SSD the SEO Spider can also be configured to save crawl data to disk, by selecting ‘Database Storage’ mode (under ‘Configuration > System > Storage’), which enables it to crawl at truly unprecedented scale, while retaining the same, familiar real-time reporting and usability. Fundamentally both storage modes can still provide virtually the same crawling experience, allowing for real-time reporting, filtering and adjusting of the crawl. However, there are some key differences, and the ideal storage, will depend on the crawl scenario, and machine specifications. Memory storage mode allows for super fast and flexible crawling for virtually all set-ups. However, as machines have less RAM than hard disk space, it means the SEO Spider is generally better suited for crawling websites under 500k URLs in memory storage mode. Users are able to crawl more than this with the right set-up, and depending on how memory intensive the website is that’s being crawled. As a very rough guide, a 64-bit machine with 8gb of RAM will generally allow you to crawl a couple of hundred thousand URLs. As well as being a better option for smaller websites, memory storage mode is also recommended for machines without an SSD, or where there isn’t much disk space. We recommend this as the default storage for users with an SSD, and for crawling at scale. Database storage mode allows for more URLs to be crawled for a given memory setting, with close to RAM storage crawling speed for set-ups with a solid state drive (SSD). The default crawl limit is 5 million URLs, but it isn’t a hard limit – the SEO Spider is capable of crawling significantly more (with the right set-up). As an example, a machine with a 500gb SSD and 16gb of RAM, should allow you to crawl up to 10 million URLs approximately. While not recommended, if you have a fast hard disk drive (HDD), rather than a sold state disk (SSD), then this mode can still allow you to crawl more URLs. However, writing and reading speed of a hard drive does become the bottleneck in crawling – so both crawl speed, and the interface itself will be significantly slower. Using a network drive is not supported – this will be much too slow. Using a local folder that syncs remotely, such as Dropbox or OneDrive is not supported. There is no benefit to using such folders as it’s not possible to restore a crawl from the contents of the database. If you’re working on the machine while crawling, it can also impact machine performance, so the crawl speed might require to be reduced to cope with the load. SSDs are so fast, they generally don’t have this problem and this is why ‘database storage’ can be used as the default for both small and large crawls. ExFAT/MS-DOS (FAT) file systems are not supported on macOS due to JDK-8205404. 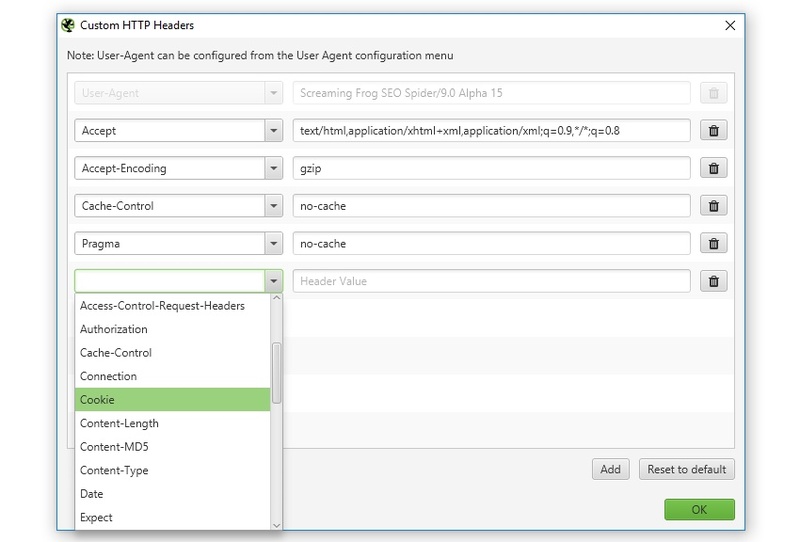 This feature (‘Configuration > System > Proxy’) allows you the option to configure the SEO Spider to use a proxy server. You will need to configure the address and port of the proxy in the configuration window. To disable the proxy server untick the ‘Use Proxy Server’ option. Only 1 proxy server can be configured. You must restart for your changes to take effect. No exceptions can be added – either all HTTP/HTTPS traffic goes via the proxy or non of it does. Some proxies may require you to input login details before the crawl using forms based authentication. This is the default mode of the SEO Spider. In this mode the SEO Spider will crawl a web site, gathering links and classifying URLs into the various tabs and filters. Simply enter the URL of your choice and click ‘start’. In this mode you can check a predefined list of URLs. This list can come from a variety of sources – a simple copy and paste, or a .txt, .xls, .xlsx, .csv or .xml file. The files will be scanned for http:// or https:// prefixed URLs, all other text will be ignored. For example, you can directly upload an Adwords download and all URLs will be found automatically. If you’re performing a site migration and wish to test URLs, we highly recommend using the ‘always follow redirects‘ configuration so the SEO Spider finds the final destination URL. The best way to view these is via the ‘redirect chains’ report, and we go into more detail within our ‘How To Audit Redirects‘ guide. List mode changes the crawl depth setting to zero, which means only the uploaded URLs will be checked. If you want to check links from these URLs, adjust the crawl depth to 1 or more in the ‘Limits’ tab in ‘Configuration > Spider’. List mode also sets the spider to ignore robots.txt by default, we assume if a list is being uploaded the intention is to crawl all the URLs in the list. If you wish to export data in list mode in the same order it was uploaded, then use the ‘Export’ button which appears next to the ‘upload’ and ‘start’ buttons at the top of the user interface. The data in the export will be in the same order and include all of the exact URLs in the original upload, including duplicates or any fix-ups performed. In this mode you can upload page titles and meta descriptions directly into the SEO Spider to calculate pixel widths (and character lengths!). There is no crawling involved in this mode, so they do not need to be live on a website. This means you can export page titles and descriptions from the SEO Spider, make bulk edits in Excel (if that’s your preference, rather than in the tool itself) and then upload them back into the tool to understand how they may appear in Google’s SERPs. Under ‘reports’, we have a new ‘SERP Summary’ report which is in the format required to re-upload page titles and descriptions. We simply require three headers for ‘URL’, ‘Title’ and ‘Description’. You can upload in a .txt, .csv or Excel file.